Hi everyone – Jennifer here, and I’m so excited about this month’s challenge! If you’ve followed the site for a while now, you’ve seen just how much I love my stencils, so having an entire month dedicated to them is just awesome!! I pulled out one of my older stencils, the Large Lotus Pattern, and taped it down to some white cardstock with painter’s tape leaving a bit of a border around the edges. Deciding to try something a little different, I grabbed my sponge daubers and colored in the flowers with a variety of colors. 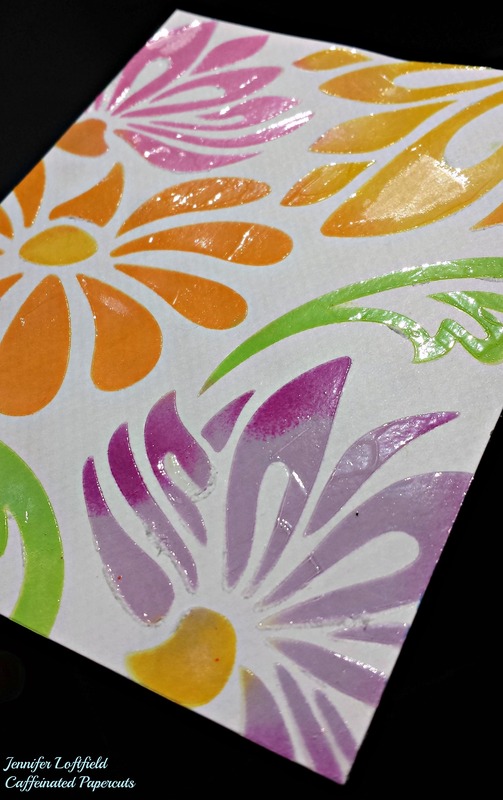 After I had my color down, I cleaned off my stencil and then placed it back down to add some of the new clear embossing paste. My oh my does it come out pretty! A word of warning – it’s thinner than the standard embossing paste and smells a little bit. If you’re sensitive to such things, I’d just open a window. 😉 I then got distracted by other things, so I let it dry overnight. One problem with that was I left it taped down, and the painter’s tape did not want to come up without a fight. Sooo I trimmed off the now ripped white border which made it the perfect size for a standard A2 card. I grabbed some of my favorite mocha layering paper for that (wait, it’s on SALE?!? I might need more…LOL). 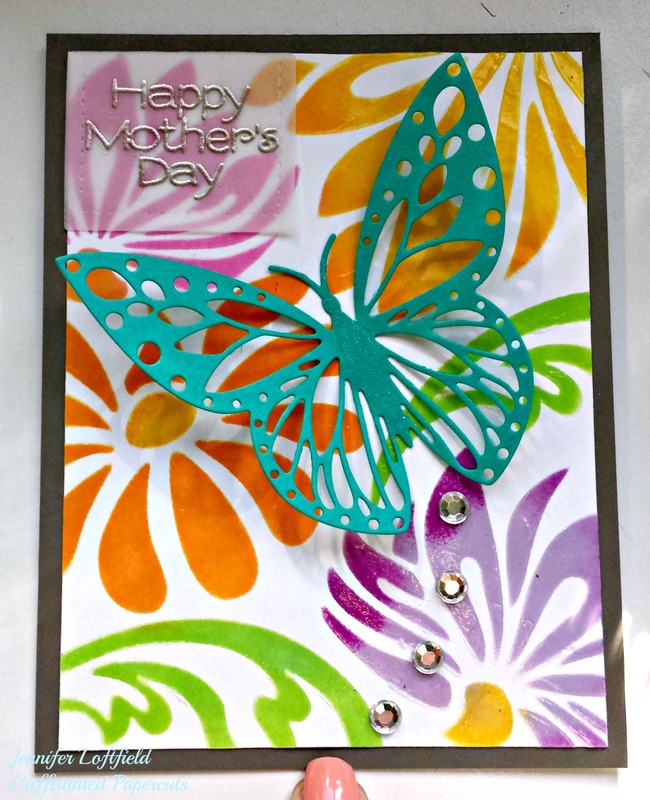 I wanted a butterfly frolicking in my flower garden, so I pulled out one of the die cuts I had leftover from this card, added a bit of Wink of Stella to the body, and glued it down. To give it some dimension I fluffed up the wings to make it soar. 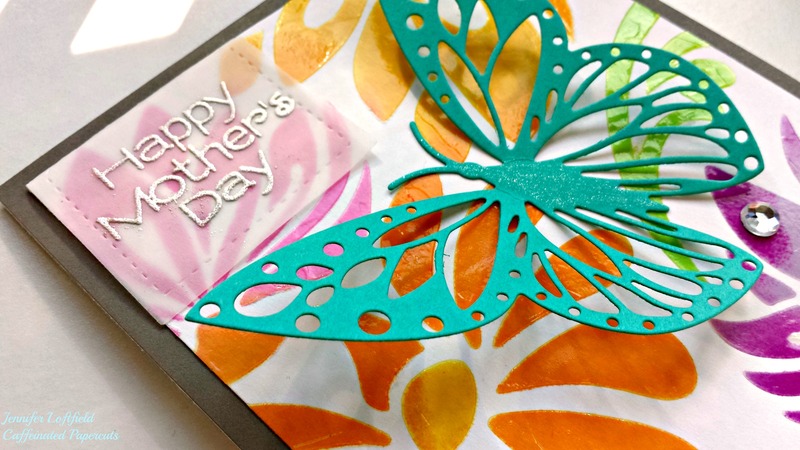 I wanted to add a sentiment but didn’t want to cover up all that lovely stenciling, so I die cut a piece of vellum and heat embossed the Happy Mother’s Day sentiment from the Celebrate Everything set. That stamp set is still one of my favorites – it has everything! I hid my glue by applying liquid adhesive behind the heat embossed letters, then folded the top of the die cut piece to the back of the card panel. 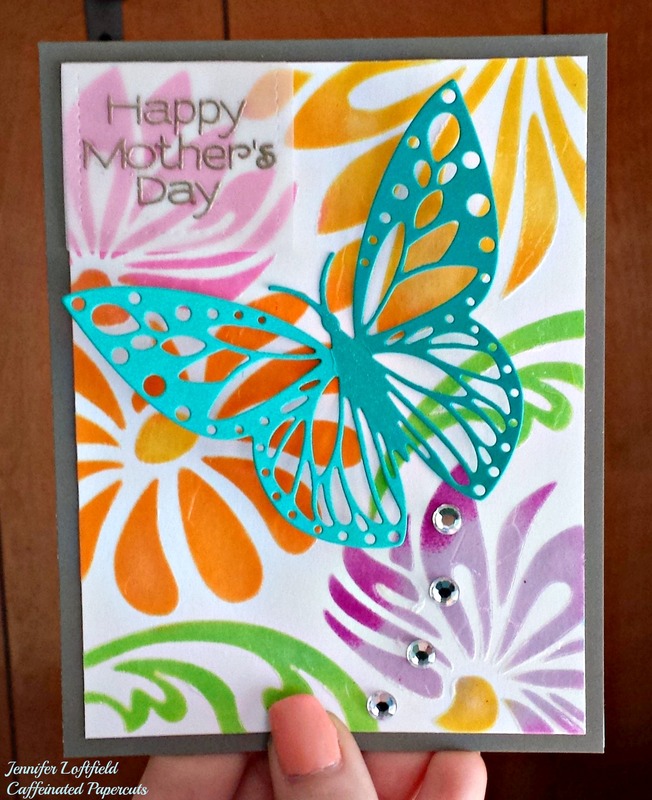 I adhered the whole panel to the card base and added some bling to trace the butterfly’s flight. All done! I hope I’ve inspired you to pull out your stencils (or snag some new ones) and play along with us this month! 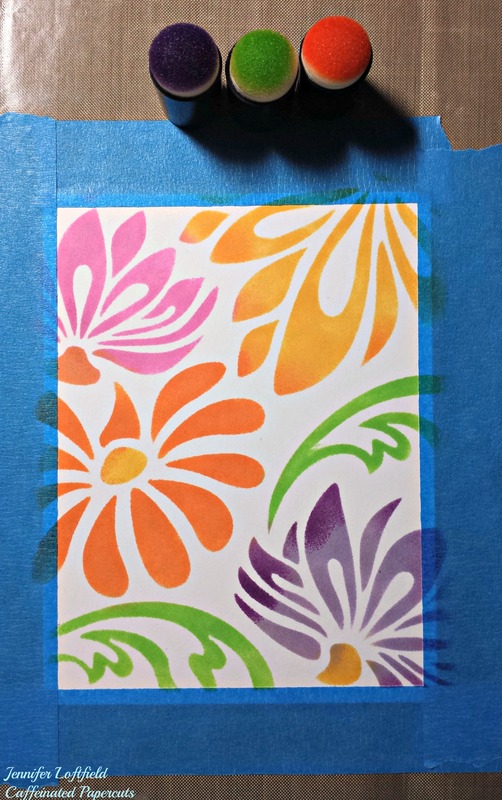 The Stencil It challenge lasts all of April so get out your favorite Hero Arts stencils and enter – you could win a $25 gift certificate to get some goodies from a2z Scrapbooking. Remember if you go shopping to use code Jennifer15 at checkout to receive 15% off your purchase of $25 or more. And don’t forget that we are on Twitter, Instagram and Facebook. Follow us on these different social media outlets so you won’t miss out on any fun promotions! I cannot wait to see what you all create with your stencils! Categories: Challenges, Flowers, Handmade Cards, Stencil | Tags: a2z Scrapbooking Store, butterfly, card, die cuts, Jennifer, stencil | Permalink. Coffee drinker, scrapbooker, paper lover, stamper, mom, cat servant, and gamer. Jen, this is my favorite of all your recent projects. I just love this!! Stunning card Jennifer!! Love the colors! love the shine on this–great idea to add the paste on top!